Maiba: A Novel of Papua New Guinea* is, you won’t be surprised to hear, my book from PNG for the Read The World challenge. I ordered it second-hand and was surprised to find when it came that it was a print-on-demand edition (I’m sure it’s a second-hand copy rather than one printed for me, btw). Of course POD services — or indeed e-books — are perfect for this kind of niche literature. Because of the challenge, I’ve been browsing around for second-hand copies of obscure books from around the world, and they don’t normally come cheap. The print quality, for the moment, is noticeably weaker; my Maiba is perfectly adequate but a bit cheaper-looking and more generic than a normal mass-market paperback. But if POD helps keep books available at reasonable prices, then a slight compromise on print quality seems a good trade-off. 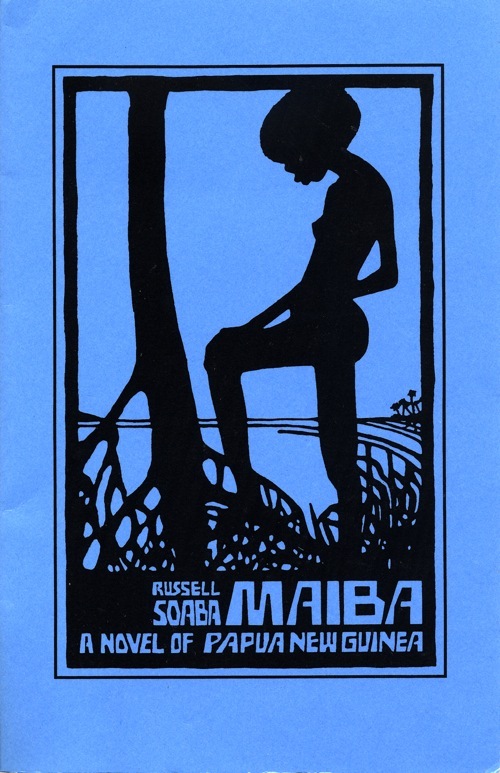 I imagine that most of the people ordering copies of Maiba are teaching or studying post-colonial literature, and it does fit fairly neatly into that niche. If I had to identify a central theme I’d say it was about the conflict between traditional Papuan culture and modernity — or change, anyway. The agents of change aren’t actually particularly strongly present in the book; the action takes place in a somewhat remote coastal village where the lifestyle is still fairly traditional (as far as I can judge from my complete lack of knowledge), but the relevance and authority of that tradition is oozing away. I imagine that tradition vs. change is going to be a frequently recurring theme in the course of this challenge; but then I suppose rapid societal change has been the experience of most of the world’s population for the past century or so. Perhaps it’s just more obvious to me when I’m reading a novel set in PNG than one set in Surrey. To be honest, I’m not quite sure what to make of it, as a novel. It’s short — only 115 pages — and rather open-ended. But it is well-suited to literary tourism; it has plenty of local detail about landscape, food, local buildings, bits of folklore and custom. And it’s well written. Perhaps my only real problem with it is that I’m not a big fan of short forms of fiction. * Or at least that’s the title on the cover; inside it’s called Maiba: A Papuan Novel. I felt exceedingly pleased to read this. I even printed it out and posted it on the notice board outside my office for the students to see. Then it got torn down by those lazy ones who can’t read or buy the book from our bookstore here. Thank you Heraclitean Fire for considering Maiba in your web spaces! Harry, this is a request, not a comment. Firstly, permission to include Heraclitean Fire on my blog list. And secondly, permission to post your review of Maiba on my blog (http://soabasstoryboard.blogspot.com)for Papua New Guinean viewers. Yes, of course, to both of those. Thank you, Harry. The PNG viewers will certainly appreciate this. Kagutoki sena kwaiveaka, in the words of that remarkable Australian writer, the late Randolph Stow.